Terms such as “Soldier’s Heart,” “shell shock,” and “Combat Stress Reaction” have all been used to describe Post Traumatic Stress Disorder in the military. War and PTSD have a long history together, as does the stigma behind mental health within military culture. In the following excerpt from The Last and Greatest Battle, John Bateson discusses the dangers of underreported PTSD and the steps we can take to help prevent military suicides. One of the ironies of battle is that the bravest soldiers, by virtue of their willingness to place themselves in the most dangerous situations, tend to be exposed to the most trauma. This, in turn, makes them more likely to develop psychological problems. At the same time, anyone can develop these problems; no one is immune. Being tough has nothing to do with it. The challenge is that for people in the military, who are used to taking care of themselves, seeking help is contrary to how they operate. Just as it is considered “unmanly” for infantry soldiers to complain about fatigue or blisters, so is it con­sidered a sign of weakness for troops in any branch of the military to need mental health services. According to a 2004 study published in the New England Journal of Medicine, only 23 to 40 percent of soldiers returning from Iraq and Afghanistan who admitted that they suffered from mental health problems said that they sought care. For the majority, fear and stigma—fear of hurting their image and ruining their military careers, and stigma from being labeled mentally unfit—were too strong. Just as all patients in Henry Ford Behavioral Health Services are assessed for suicide, so should every service member be evaluated for suicidal risk. Instead of leaving it up to individuals to come for­ward on their own, the military should initiate treatment measures for all who serve—particularly members of the National Guard and Reserves, who often are less prepared than active-duty troops to deal with traumatic situations and receive the least support. Evaluations should focus less on written questionnaires and more on extensive, mandatory, one-on-one mental and physical examinations. These evaluations shouldn’t be limited to the service member, either; fam­ily members should be interviewed as well (separately and confiden­tially). In addition, the evaluations should be conducted every three months for three years following deployment in order to identify delayed responses to combat. The assessment is done just before a soldier comes home, however, and the only thing that service members want to do at this time is see their families. Thus, there is a tendency to answer questions quickly and mindlessly. Moreover, if soldiers admit to any problems, they believe—with sufficient justification—that it could delay their homecoming. According to a 2008 study, troops are two to four times more likely to report depression, PTSD, suicidal thoughts, and interest in receiving care when they complete an anonymous survey than when then they fill out the PDHA. On the plus side, as a result of the 2010 National Defense Authorization Act, medical and behavioral health professionals are now required to conduct PDHA evaluations indi­vidually and face-to-face. Previously, written questionnaires were distributed to groups of soldiers who completed them in the presence of their peers. The limited usefulness of the PDHA led the military to implement a follow-up screening called Post Deployment Health Re-Assessment (PDHRA). Administered three to six months after a soldier returns home, it assesses the person’s mental health at that time with the assumption that he or she will answer more truthfully than the first time. The VA’s National Center for PTSD developed a simple and sen­sible PTSD screen to be used by doctors in primary care settings. Soldiers are asked if, in their lives, they have ever had an experience that was so frightening, horrible, or upsetting that, in the past month, they: 1) had nightmares about it or thought about it when they didn’t want to; 2) tried hard not to think about it or went out of their way to avoid situations that reminded them of it; 3) were constantly on guard, watchful, or easily startled; or 4) felt numb or detached from others, activities, or their surroundings. A “yes” answer to any of the questions doesn’t confirm a diagnosis of PTSD, but it indicates some probability. Not every soldier needs treatment. Many are able to adjust to civilian life on their own. Every soldier needs help of some kind, though, to process feelings about his or her wartime experiences. By assuming that this is the case, and assessing each service member for suicide rather than expecting those in need to come forward on their own, the military can reduce the stigma associated with seeking help and keep more troops from killing themselves. Featured image credit: U.S. Soldiers with the 3rd Brigade Combat Team, 1st Infantry Division stand at attention after receiving awards from Army Gen. Lloyd J. Austin III, the commander of U.S. Central Command, at Forward Operating Base Apache, Zabul province, Afghanistan, Nov. 29, 2013, by SGT Antony S. Lee. Public Domain via Wikimedia Commons. 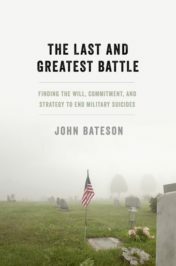 John Bateson is the author of The Final Leap: Suicide on the Golden Gate Bridge and The Last and Greatest Battle: Finding the Will, Commitment, and Strategy to End Military Suicides. For more than 15 years he was executive director of a nationally certified suicide prevention center in the San Francisco Bay Area. He served on the steering committee of the National Suicide Prevention Lifeline and was part of a blue-ribbon committee that created the California Strategic Plan on Suicide Prevention.